Centuries ago a race of giants and witches inhabited the Blackstairs Mountains. Their tables, chairs and footprints can still be found across the landscape today. As in all societies rivalries built up over time and one day this escalated into a full blown feud between a witch who lived on Mount Leinster and her enemy in Wexford/ Wicklow. In her anger she picked up a stone, her fingers crushing its sides and hurled it towards her antagonist. It soared through the air and came crashing down in the townland of Clonee where it remains today. As she threw it, she lost her balance and slid down the mountain, her huge bulk carving a track through the turf leaving two huge banks of earth along her course which can still be seen on the Black Banks. She finally came to rest in the modern day village of Myshall where the impact from her knees was left in a stone now in the graveyard. That is the folklore, now for the archaeology. The first in the new series of posts called “Feature Friday” is a spectacular site on the slopes of the Black Banks. Overlooking the village of Myshall, this feature can be seen from the North including the Corribut Gap carpark. Known locally as the Cailín Slipes, this feature has been interpreted as a cursus monument. Cursus comes from the Latin racecourse as early antiquarians believed them to be Roman race tracks. Cursus monuments consist of two long banks running parallel to one another which are sometimes joined at one end by a straight or rounded bank. They date to the Neolithic period (c.4000-2500BC) and their function is still a matter of debate. They vary in length with the most famous examples in Ireland being the one next to Newgrange (100m long & 20m wide) and one on the Hill of Tara (250m long & 20m wide) more popularly known as “The Banqueting Hall”. Cursus monuments also occur in Britain such as at Stonehenge. The biggest and most elaborate cursus is Dorset cursus in the sout of England. This has a total length of approximately 10km and it has been estimated that half a million work hours went into its construction. Much of it has been levelled today but it is still visible as cropmarks. 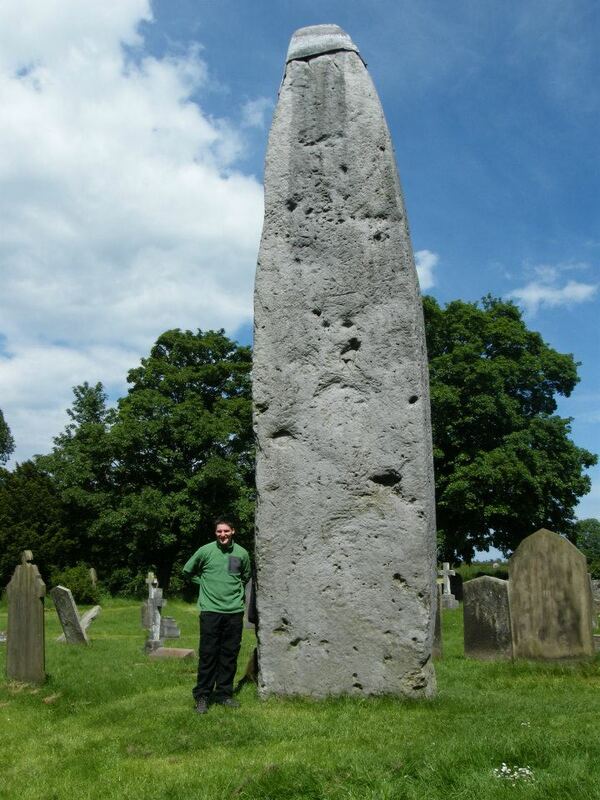 The great Rudston monolith (7.6m) in Yorkshire England has three cursus monuments leading up to its hilltop location. Generally they are found near or leading up to other Neolithic monuments (e.g. beside the Newgrange passage tomb, leading up to the Mound of the Hostages at Tara or Stonehenge). In the case of the Dorset cursus, prehistoric monuments are built all along its course. 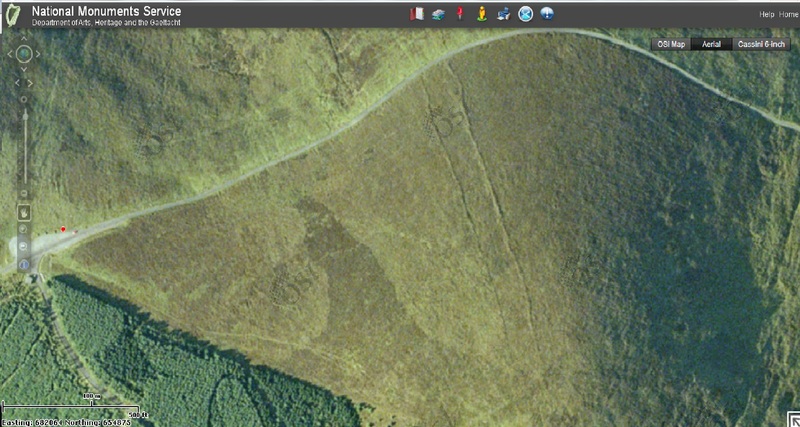 As well as these lowland examples, cursus monuments have also been identified in the uplands such as the example on Keadeen Mountain, Wicklow (see Ivor Kenny’s blog for a more detailed discussion on that example http://ivorkenny.wordpress.com/tag/cursus/). While the Keadeen example appears to be lead up to a summit cairn, the same cannot be said for the Black Banks although a feature now either destroyed or overlain by peat may have once stood at the summit. Alternatively it could have led to the ridge from where the summit cairn on Mount Leinster could have been accessed. The only prehistoric features in the area are a possible passage tomb/ summit cairn on the summit of Slievebawn and the Nine Stones stone alignment. Climbing up along its course is difficult as the builders appeared to have chosen the steepest part of the mountain!!! Peat growth and vegetation makes it difficult to identify the banks in places while walking along it and the construction of the roadway leading to the Nine Stones carpark has cut through and obliterated all sight of it from this position. From satellite imagery we can see it continuing downslope towards Coolasnaghta however this is impossible to see on the ground. Whatever its true purpose, function and reason for construction, the local folklore around Myshall and the area has an interesting explanation for its formation as we have seen. A witch who lived on Mount Leinster got into an argument with another witch in Wexford/ Wicklow. In a fit of rage she picked up a stone and threw it at her enemy but in the process lost her balance and slipped down the mountain. The result was the huge track we see on the mountain today known as The Cailín Slipes or the Witches Slide. 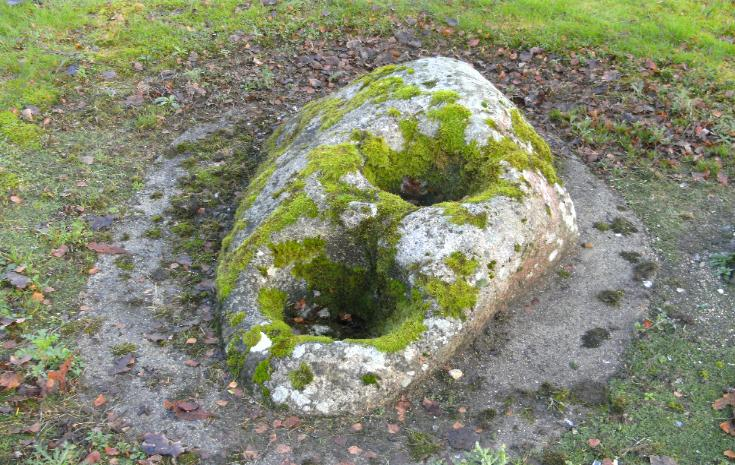 The standing stone in Clonee is said to be the stone she threw as evidenced by the grooves left from the mark of her hands. The point where she finally came to rest can be seen in Myshall graveyard as the impact from her knees left a mark in a stone there, we know it today as a medieval double bullaun stone. Kite Aerial Photograph taken in November of a site known as Jack Ryan’s Walls on the eastern slopes of Knockroe Mountain. The site is east of Shannon’s New Fields. Nearby enclosures show signs of ridge and furrow indicating former cultivation, Ruin of this site marked on the first edition 25″ maps (1890’s) but not on first edition 6″ maps (1839). It consists of two structures. There is no sign of a formal fireplace in it’s current state. The green grassy patch in the small outside enclosure indicates a higher soil fertility possibly from keeping an animal such as a pig on the site.